Formed in 1927, at a time when the St Ives art colony was considered to be moribund, the St Ives Society of Artists flourished during the 1930s and 1940s, attracting many of the leading artists of the period, who had at some juncture in their careers painted in Cornwall. Despite its name, therefore, the Society featured not only contemporary St Ives artists but also the best living artists who had ever worked in Cornwall. More than 70 works by members were regularly included in the Royal Academy annual exhibition in the 1930s and the touring exhibitions arranged by the Society were in great demand at municipal Art Galleries around the country. In 1947, a touring show was even staged in South Africa. Members included the Royal Academicians Stanhope Forbes, Julius Olsson, Arnesby Brown, Adrian Stokes, Algernon Talmage, Terrick Williams, Lamorna Birch, Frank Brangwyn, Laura Knight, Dod and Ernest Procter, Bernard Fleetwood-Walker, Sir Alfred Munnings and Stanley Spencer. 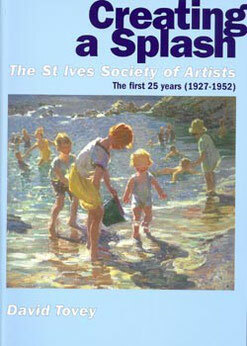 Other artists featured, whose works are in public collections, include Sir Claude Francis Barry, Arthur Burgess, Leonard Fuller, Harold Harvey, Arthur Hayward, Moffat Lindner, Arthur Meade, Fred Milner, George Bradshaw, Bernard Ninnes, John Park, Charles Pears, Leonard Richmond, Dorothea Sharp, Charles Simpson and the Society’s principal organiser, Borlase Smart. The Society also had a strong ‘black and white’ section led by Sydney Lee RA with Alfred Hartley, Job Nixon, W.Westley Manning and Raymond Ray-Jones amongst others. During and after the Second World War, artists with a more modern approach, such as Ben Nicholson, Barbara Hepworth, Wilhelmina Barns-Graham, Peter Lanyon, Sven Berlin and Terry Frost, joined the Society, but tensions arose with some of the more traditional members and the moderns resigned en masse in 1949 amidst great acrimony. By 1952, it was clear that the hey-day of the Society, many of whose leading members were now elderly, was over, as representational work fell out of favour. The book acted as an exhibition catalogue to a very successful exhibition, which toured the public art galleries in Penzance, Lincoln, Doncaster, Hereford, Sunderland and Newport between June 2003 and July 2004, attracting over 80,000 visitors. However, it is intended as a long-term work of reference, as it also provides detailed biographical notes on more than 300 artists who were involved with the Society during this period. It is extensively illustrated.